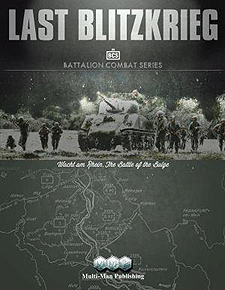 Last Blitzkrieg is the first entry in the new Battalion Combat Series (BCS), which simulates combat in World War II (and beyond) at the battalion scale. Its subject is the German Addennes offensive Wacht Am Rheim (the Battle of the Bulge) on four detailed maps (at 1km per hex) and with 1,680 counters. Last Blitzkrieg covers the battle in a level of detail rarely seen before and does so in a very playable manner. The BCS itself was designed to show that battalion level combat is its own subject, being neither "small division" nor "large platoons". The results may surprise some players, but will hopefully pique the interest of all and allow them to see many things they thought they already knew in a fresh light. Last Blitzkrieg was designed to bring all of this - and more - to your table in a very historically accurate game that is jam-packed with information. The BCS was designed with twin goals: to provide the most insight possible into a Battle and to provide games that have maximum playability.